Regression modeling is one of the most important statistical techniques used in analytical epidemiology. 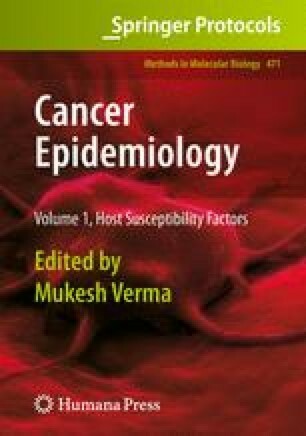 By means of regression models the effect of one or several explanatory variables (e.g., exposures, subject characteristics, risk factors) on a response variable such as mortality or cancer can be investigated. From multiple regression models, adjusted effect estimates can be obtained that take the effect of potential confounders into account. Regression methods can be applied in all epidemiologic study designs so that they represent a universal tool for data analysis in epidemiology. Different kinds of regression models have been developed in dependence on the measurement scale of the response variable and the study design. The most important methods are linear regression for continuous outcomes, logistic regression for binary outcomes, Cox regression for time-to-event data, and Poisson regression for frequencies and rates. This chapter provides a nontechnical introduction to these regression models with illustrating examples from cancer research.